For the past several weeks, my family and I have been traveling in southern Africa. We went there to visit our son who is serving in the Peace Corps in Namibia. During our time we visited not only Namibia, but Zambia (going to Victoria Falls), and South Africa. Most of our South Africa travels were in the Cape Town area. Upon arriving in South Africa, you immediately notice the overwhelming impact that Nelson Mandela has had. Everywhere are quotes and likenesses of him. Products and places carry his name. This is the land of Mandela. 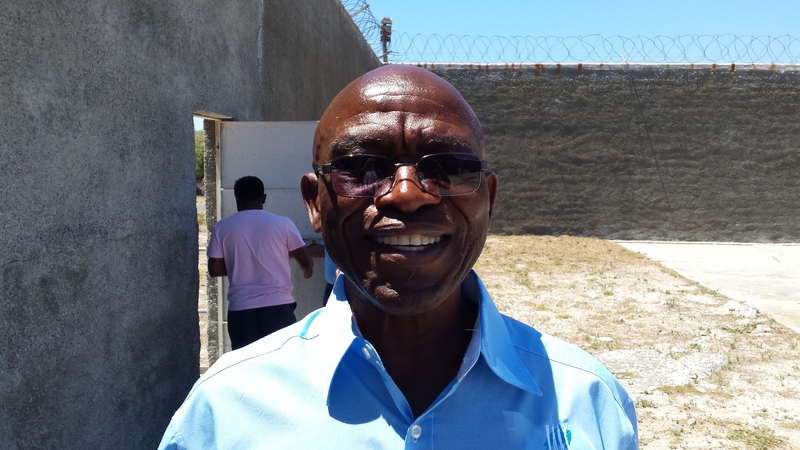 On the last day of our trip, we visited Robben Island, where Mandela was imprisoned for 18 years. In total he was incarcerated for nearly 27, finally being released in 1990. He then served as the first president in post-apartheid South Africa. When I travel, I often read about the place I am going to. Sometimes the books I read are more cultural, others more historical. When we arrived in Cape Town, I purchased a copy of Allister Sparks’ Tomorrow Is Another Country: The Inside Story of South Africa’s Road to Change. I admit that my knowledge about the political change that went on in South Africa in the 1990s was limited. I highly recommend this book. In reading it you get an up close and detailed appreciation for the difficult and often dangerous process that was undertaken from the mid 1980s through the election in 1994. You also walk away appreciating the way Mandela navigated the process, and held fast to advancing change through negotiations and political maneuvering. Traveling to Robben Island is by ferry which you take from the Victoria and Albert Waterfront area. We actually had our trip rescheduled twice because the waters were rough. The ferry ride is about 45 minutes. You can see Cape Town from Robben Island. The views of Table Mountain and the Cape Town waterfront from the ferry are extraordinary. The cost of the trip is R340 (which is about $27 U.S. dollars). On the island, the first part of the tour is by bus where I guide shares with you about the island. You learn that it was early on a leper colony. We drove past a cemetery for those who died there, and a church built in 1841 for the inhabitants. Later, the island was a military base. Though prisoners were there throughout its use (since the Dutch arrived in the 17th century), it wasn’t until 1961 that it was used primarily as a political prison. Today Robben (Dutch for “seal”) Island is a UNESCO World Heritage Site. During our bus tour we learned about the important conservation efforts that are being made on the island. Because of climate change, the penguin population has vanished. Keeping us on the bus for the tour was a way of making sure we didn’t damage parts of the island that are being conserved. Our bus tour ended at the prison. Here we were met by our guide Itumeleng Makwela. And he just wasn’t a guide, he was a political prisoner on the island from 1983-1990. He didn’t meet Mandela though until years later. Mandela left Robben lsland in 1982. Makwela was from near the Botswana border and was arrested for political activities. He talked to us about his stay including being tortured, and working in the kitchen. He participated in hunger strikes to improve conditions (which was hard because he worked in the kitchen: hard to engage in a hunger strike when the food is all around you, he told us). He talked about how prisoners shared information with each other by putting notes in tennis balls and tossing them to the next prison area. Many of the prisoners continued there education at Robben Island by taking extension courses through the University of London. For prisoners, the most significant punishment would be denying them the right to learn. Food rations were different between “coloured and Asiaties” prisoners and “Bantus” – or Blacks. The Blacks got less rations. When he arrived, most prisoners slept in communal areas on blankets on the floor: no mattresses. Conditions improved later. He remembers that when the International Committee of the Red Cross (ICRC) would visit, they were fed better and “cleaned up” to impress the ICRC. Today, he lives on the island with his family including four grown boys. He lives there in part because Mandela asked former political prisoners and former guards to return as a form of reconciliation. Being a guide at the prison has helped him deal with the trauma: doing presentations has been therapeutic for him. He is an incredible person and we thanked him for sharing his experiences. My wife was insightful enough to get his autograph afterwards. After his signature, he wrote “1983-1990,” indicating the time he was there. Much better than getting the signature of a rock star! Below is a short video of Makwela from the beginning of our tour with him. There is also a more detailed interview with him here. If you Google his name, there is much about him you can learn. This was clearly the highlight on my visit to South Africa.